February has seen me taking part in a group project as part of my university studies, and it was a testament to my time management skills more than anything else I have ever done. I am use to juggling several projects, children commitments and my own personal commitments but this project required me to work to someone else’s time table and to do so with a group of 15 other people. Now you can image how hard it is to get 15 people from all over Yorkshire together at one time when we all work different hours, have different commitments and the odd technical issue thrown in. But we have managed it and the 28th of February saw the end of the project and a sigh of relief from us all – even though we loved having the collective support! 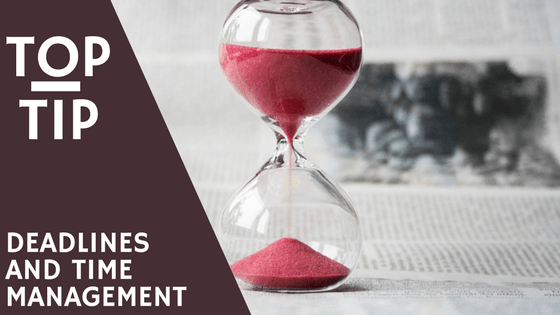 It got me thinking though about time management and meeting deadlines – how do you manage your time to meet a deadline? Here are my top tips to managing. I use a number of tools and those that receive my emails or follow me on LinkedIn will have seen what those tools are – number 1 being Trello. It helps me to break down a project into bite size manageable chunks, similar to the timetable our tutor gave us with set deadlines for each step of the project. It can be easy to get distracted or go off on a tangent, but then you find yourself with a bunch of half-finished projects and no track of where you got with them. This is where I love reminders – they maybe pesky little pings on your phone but they do save your projects. Whether you’re having fun or not, time will fly by without you noticing. That 5 minutes break on Facebook, or a quick look at the news can turn in to channel surfing and before you know it an hour has gone by and your deadline is ever closer. I am guilty of this but found timing my breaks helps me restrict them and cut back on distractions. I will turn the kettle on and in the time it takes to boil I will flick through Facebook, or put a bit of washing away (downside to working from home!) then as soon as my cuppa is ready I am back at my desk and working away. Taking a break though is not a bad thing, twice a week I take an hour break for gym and twice a week I start late so I can spend time with family/friends or take care of housework, this helps me get out and about as well as benefits my health. These are breaks for set times on set days, so I can easily plan my work around them and nothing has to suffer. What breaks do you take, and how often? The number one thing not to do when you have a deadline is stress! Yes I know easier said then done, but when you stress you make small mistakes that suddenly seem overly proportional and you start seconding guessing yourself. So a 2 minute job to fix ends up taking 20 minutes, a few blue words and handful of hair pulled – or is that just me? Need help with your Time Management? Then get in touch and let me help you put together a workable time table.